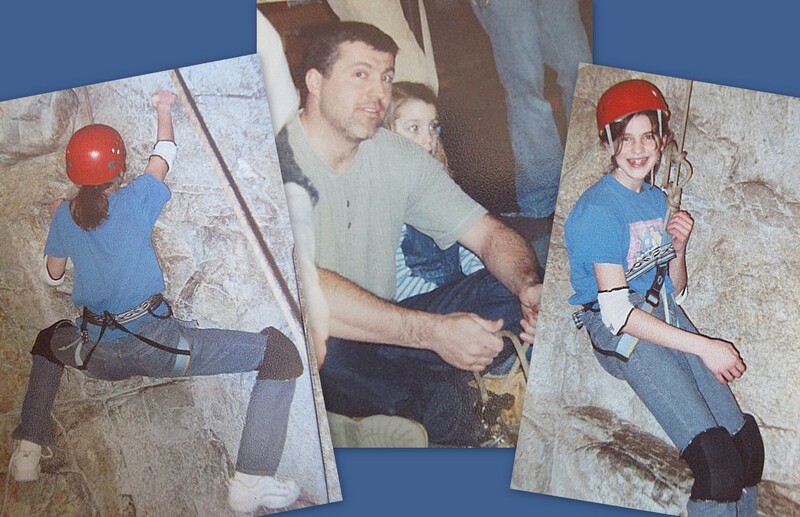 Once upon a time, a little girl went rock climbing. She was all of maybe ten years old and the climbing wall at the museum didn’t look so threatening in the face of the dirt cliff she scaled on a regular basis. In fact, the climbing wasn’t hard in the least, and when she reached the top she could have stayed there looking down at the crowd of people forever… because the only way down was to jump. I remember that moment clearly—wondering why I couldn’t simply climb back down the wall, retracing my steps and placing my weight where I could trust it, rather than dangling at the end of a rope high above the museum floor. Because I could have done that. I gladly would have done that. But no, they wanted me to step out over that ledge and simply hope for the best, and I’m sure you understand why I wasn’t really comfortable with that. I shook my head and backed away from the ledge. From the fear. From the unknown. Sometimes I doubt my Father. And I’m not talking about the one who sat at the end of my rope that day (though I surely doubted him in that moment). I’m talking about the One who has been holding my rope since the day He first designed to set me on this planet. You know, I don’t really remember what took place that day at the museum. I’m not sure if I finally took that step on my own or if my dad gave a gentle tug on the rope, sweeping my feet out from under me and leaving me with no other choice (he at least threatened to do just that, because that image stands out in my mind like an actual memory would). I do remember not falling to my death. And I even remember thinking that (dare I confess this?) the ride down was actually kind of fun. I also know that I’m standing here today, faced with the same choice. And, you know, I’m thinking it might be best to simply close my eyes, take a deep breath, and step out into the expanse before me. One of my favorite lessons I learned about the Lord while rock climbing on a youth outing several years ago. Our pastor was certified to belay so he tied in my harness and I made the smart alec comment, “If I fall, it’s your fault.” I meant, if I came crashing to the ground and broke a leg, it was his fault. He wasted no time in saying, “If you fall, it’s not my fault but I’ll catch you.” As my belayer, he couldn’t keep my feet from slipping off the rocks but he could keep me from crashing to the ground. I think this is a powerful lesson because just as I slipped on those artificial rocks, I slip in every day life. Yet just as my pastor caught me, so does Christ. If (or maybe “when”) we fall, it’s not His fault, but He catches us. Awesome, awesome, awesome visual. And so true. We fall all the time, but God holds us steady and gives us that much needed chance to get back on the wall. Thanks for sharing.